I have a tip to share with you--a simple little secret that you'll love. Simply cut an apple (any variety) into quarters. Put the apple pieces in a small pan. Fill the pan with water, then add some cinnamon sticks and whole cloves. Sprinkle in a little ground cinnamon if you want. Now here's the secret: Add a teaspoon or more of vanilla extract. Simmer on the stovetop, being careful not to let the water boil away. Hint: spray the pan with non-stick cooking spray before adding the ingredients. That will make the pan much easier to wash (and will make a huge difference just in case you accidentally let the mixture boil for too long). I know vanilla extract is rather expensive, but you don't have use a lot--and you'll be amazed at the difference it makes! 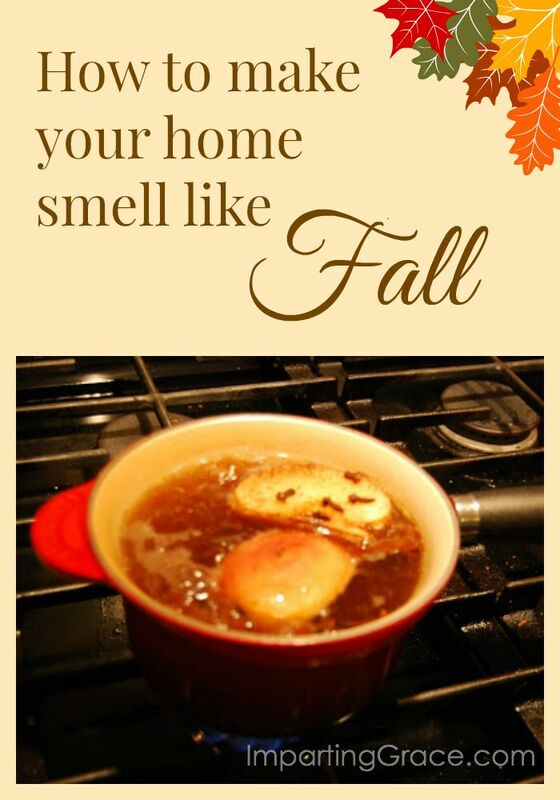 Your house will smell delicious. One warning: your family will probably come in and say "What are you baking?" because it will certainly smell as if you've got apple pie or cinnamon rolls in the oven. And here's a little tip: next time you're at a thrift store, pick up a little pan. Use that for simmering your potpourri instead of one of your good pots. That way, you can keep it on the stove and just keep replenishing the water and spices as needed. Do be careful not to let the mixture boil dry--that would stink up your home instead of making your home smell like apple pie. Now, if you need to bake something rather than just enjoying the smell of fresh-baked goods, check out this recipe for pumpkin bread or this one for apple cake. You'll love them, I promise! This really, really makes me wish that I could smell!!!! Perfect timing, we are having some friends over for game night tomorrow night. Thank you! I just love this idea. I'm going to get some going right now. Love your blog. I'm curious, do you think that cheap, nasty imitation vanilla would give off a similar scent? Because I'd buy that and save the good stuff for cooking! I can almost smell the goodness just by looking at the photo. Great "recipe"
Lovely idea! I sure people will think you're baking an apple pie! That's so funny. I just got done telling someone that simmering cinnamon sticks and orange cloves was one of my favorite ways to scent the house during Fall. I like your idea even better with the addition of apples and vanilla. Thanks for the great tip! I saw this earlier today and couldn't wait to get home to try it. Thanks for the great idea. I might take the pan to school and simmer it on a little burner in my classroom. I'll let you know if I do! I love this idea, Richella. Just do be careful, as I have a dear friend who simmers something similar on her stove and she's ruined several pots by forgetting it's on the stove. Oh how I LOVE that fall scent! I am trying this out for sure. Would be great all through the holidays! I also prepared it at my home and added so much chilly powder and turmeric powder because I am too much crazy for its spicy test. I like your idea even better with the addition of apples and vanilla. What a great tip! I think my grandmother used to do this around Christmas. Mmmmm, I love the smell of Autumn and this sounds like you hit it right on. I'm definitely trying this, thanks Richella! I think mothers of sons truly appreciate a beautiful smelling house! It says, "Hey! There's still a girl here!" That sounds wonderful!!!! I love all the fall baking smells! YUM! Thanks for the tip! Mmmm...I love this idea, Richella! Definitely going to try it. How long does this stay good? Do you just cover it and leave it on the stove for the next use? Yes, this keeps well on the stovetop. I don't cover mine--I leave it open on the back of my stovetop if I'm going to use it again. If you want to keep it for a good while, you could place it in the refrigerator. Just be sure to get it out and use it so that it doesn't get all moldy! How long will this last? Can I have it going on the stove for a few hours? Hey Katie! Yes, you can keep this going on the stove on simmer. Just keep an eye on it and add water as needed. Do NOT let it run dry--that smells awful and could be a fire hazard. Love this technique - but definitely keep an eye on it...the water will disappear quickly! I sometimes use orange peelings with cloves and cinnamon - another great combo! Can you use one of those small crock pots? The ones for dips? Instead of the frying pan, can you use one if those small crock pots ? Like the ones for dip? Yes, I think you could use one of the little crock pots for this. You might want to get it hot on the stove and then transfer it to the crock pot to simmer. Whatever method you use to simmer the mixture, just be sure not to let the water run dry! You'll want to replenish the water from time to time, especially if it's on the stovetop and really bubbling. This would probably be great in my steamer on top of the woodstove!! can you substitute ground cloves? I got so excited reading this I ran out to get the missing ingredients and just put it on the stove! It already smells wonderful! Yay! Thank you for sharing this recipe! Let me ask you something, can i put it in a bottle or something like that and let it site in other rooms?! This would be perfect to have in a small crock pot, and just keep on low. While in ur CP it can keep for about a month, just make sure to keep the water levels up. I love doing this every fall!! I am cooking this right now and I can already tell it will smell AMAZING!